With the release of the i865PE 'Springdale' chipset in May of this year, Intel introduced a core logic that was targeted squarely at the masses. And did it ever sell! Enthusiasts, and regular consumers alike have been flocking towards this gem of a chipset, largely because it offers 95% of the performance of the i875P for about 80% of the price. With the ability to turn on Performance Acceleration Technology (PAT) in the first revision of the i865PE chipset Intel had a problem on their hands. Even without PAT enabled, the i865PE performed almost as fast as the more expensive i875P. With PAT enabled, i865PE performance was identical to that of the high end i875P chipset, but at a fraction of the price. Intel were not about to continue competing with themselves, and it's rumored that on second revision i865PE chips PAT had been physically cut from the equation. Epox are a favorite motherboard manufacturer to many consumers, even if they are somewhat small when compared to the likes of MSI, Asus or Gigabyte. 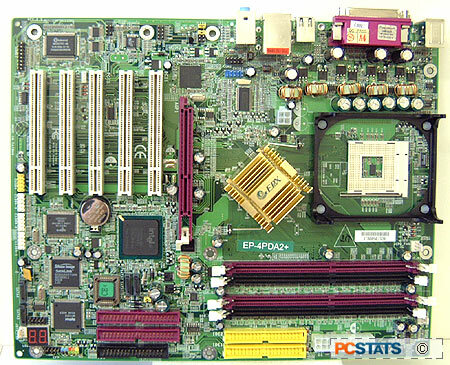 It's not just that Epox motherboards are held in good regard, and typically fast, it's that the boards also tend to offer consumers good value. Looking at the feature set and design of the Epox 4PDA2+ Rev 2.0, it's quite clear that designers built for the present, without cutting short on the future. Too many motherboards these days are being designed for the common PC of six months to a year from now. Based on the i865PE the Epox 4PDA2+ can be used with any current 'Northwood' Pentium 4 processor (400/533/800MHz FSB). With its four DIMM slots the board can accommodate up to 4GB of PC3200 DDR RAM. Standard onboard features include 5.1 audio, Gigabit LAN (not CSA), IEEE 1394, Serial ATA/Serial ATA RAID, IDE RAID and of course Epox's Port 80 diagnostics card. Despite all the onboard features, Epox still include five PCI slots for your upgrading needs.